Gram Staining without Microscope ! Gram staining, though being an antique technique (about 125 years old), still holds an arterial position in Diagnostic Microbiology. It is used to differentiate bacteria into Gram positive and Gram negative, based on their cell wall's physical and chemical properties. In the interesting flow chart of systematic bacteriology, Gram reaction of an unknown microbe forms the foremost step in identification. Now, imagine a situation, where you have a bacterial isolate that needs to be Gram stained. But , alas! 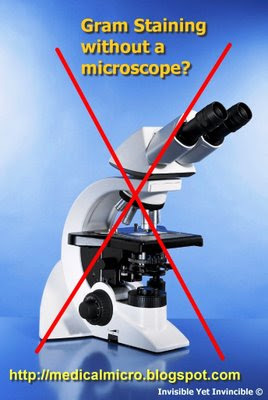 you do not have a microscope or stains & reagents for Gram staining. How will you proceed about to find the Gram reaction without microscope? Gram’s staining method, though being a basic method, is complicated, messy and prone to manual and technical errors. The problems with Gram’s method have lead to a search for other tests that correlate with the cell wall structure of the gram-positive and the gram-negative cells. Several modifications or improvements or alternatives to the classical gram stain have appeared in the literature. The KOH String Test is done using a drop of 3% potassium hydroxide on a glass slide. A visible loopful of cells from a single, well-isolated colony is mixed into the drop. If the mixture becomes viscous within 60 seconds of mixing (KOH-positive) then the colony is considered gram-negative. The reaction depends on the lysis of the gram-negative cell in the dilute alkali solution releasing cellular DNA to turn the suspension viscous. This method has been shown effective for food microorganisms , and for Bacillus spp , although it may be problematic for some anaerobes. This test has the advantage of simplicity, and it can be performed on older cultures. False negative results can occur in the test by using too little inoculum or too much KOH (DNA-induced viscosity not noticeable). False positive results can occur from too heavy an inoculum (the solution will appear to gel, but not string), or inoculation with mucoid colonies. This can serve as a valuable adjunct to the tradition gram stain method. L-alanine aminopeptidase is an enzyme localized in the bacterial cell wall which cleaves the amino acid L-alanine from various peptides. Significant activity is found almost only in Gram-negative microorganisms, all Gram-positive or Gram-variable microorganisms so far studied display no or very weak activity . To perform the test, the reagent is used to make a suspension (with the bacteria). Aminopeptidase activity of the bacteria causes the release of 4-nitroaniline from the reagent, turning the suspension yellow. The test is especially useful for non-fermenters and gram-variable organisms, and is a one step test with several suppliers of kits. Results of the test are available in 5 minutes. A popular combination of fluorescent stains for use in gram staining (particularly for flow-cytometry) involves the use of the fluorescent nucleic acid binding dyes hexidium iodide (HI) and SYTO 13. HI penetrates gram-positive but not gram-negative organisms, but SYTO 13 penetrates both. When the dyes were used together in a single step, gram-negative organisms are green fluorescent by SYTO 13 while gram-positive organisms are red-orange fluorescent by HI which overpowers the green of SYTO 13 There are commercial kits available for this procedure, which requires a fluorescent microscope or a flow cytometer. This LAL-based assay makes use of the same reaction used for the chromogenic LAL test. Gram-negative organisms, with bacterial endotoxin, initiate the LAL coagulase cascade that results in activation of the proclotting enzyme, a protease. In the LAL test, this enzyme cleaves a peptide from the horseshoe crab coagulen, resulting in a clot. It can also cleave a peptide from a synthetic substrate, yielding a chromophore (p-nitroaniline) which is yellow and can be measured photometrically at 385 nm . Gram-positive organisms, lacking endotoxin, do not trigger the color change in this method, while gram-negative organisms do trigger the colour change and the advantage is that the results are available within 10 minutes. N-alanine 4 nitro anilide strip can be used to see the colour changes to yellow if the organism is Gram negative.